Below is the bicycle "surrey" that Allison Rowe, Carlos Ramirez, and myself constructed. Ahead of the bicycle is a "flock of birds", made to look like they are helping pull the surrey along. All parts were made from recycled elements. The seat upholstery was made from the inner tubes of bicycle tires, the roof and birds were made from a kite surfing sail. Blogging is proving to be more difficult to keep up with than I thought. Plus, I can barely keep up with the pace of my life. Grad school, family, work. Forget going to the gym, forget getting sleep, forget lazy days, forget ever seeing movies, or TV for that matter! So, I apologize for not being more on top of this! I promise, promise, promise to write more Blog. My final critique is scheduled for December 4. I don't know what I will put in it. I am halfway through a second painting, yet I am not 100% into what the painting is turning out like. 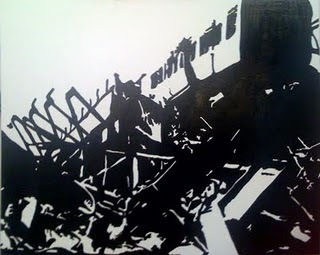 I am doing b & w paintings (really blue black and white) and they have a cut-out look to them. Thing is, I YEARN for color, but have no idea how it is going to make it back into my painting. I do know that I am enjoying my research though! I have really saturated myself with the history of the women on my mother's side of the family. Some really interesting photos and stories have surfaced and I am eager to learn more. I have been thinking of creating a narrative based on fictional/non-fictional characters within a historical context. Concurrently, I am trying to figure out how I can get to London during my spring break and do a proper investigation/excavation of locations, artifacts, stories to further enrich this process. 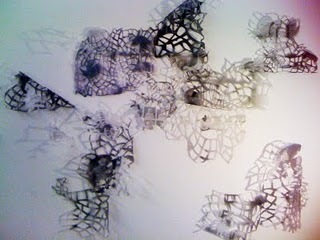 Maybe do some audio recordings, make castings, rubbings. I don't know! It will be fun to see how this all presents itself as an art form. I have been buried under a mass load of things to do-----to be expected, huh? Lets see, in the last 2 1/2 weeks I have been to LA on a school trip, read a couple of books (that weren't required, but recommended---found the time, don't know how), had my first official critique, locked my car keys and locker key in my locker at midnight and went into hysterics (blame the sleep deprivation), and gained a little clarity in the work I am doing. LA: The first year MFA's spent 2 full days checking out galleries in Culver City (Blum and Poe), the Gagosian gallery in Beverly Hills, the MOCA, UCLA's Hammer Museum, the Museum of Jurassic Technology, CLUI, FarmLab, and the studios of Jim Shaw and Marnie Weber (who were both unbelievably interesting!). We stayed in the Bonaventure Hotel in downtown, a bit fancy for grad student standards, but I wasn't complaining! My work right now is going pretty well. A couple of weeks ago I was advised to complete a Cosmology on myself. This exercise is basically a huge brainstorming session that is all about my universe. It was going to bring some clarity and organization to my thoughts, since I had too many ideas and couldn't boil it down to some clear and concise points. Not knowing where it would go, I ended up on the phone with my mom, interviewing her on her life story, info on her mother, father, grandparents, you name it! What was interesting, I began to see a lot of common words and themes. Haunted, Fear, Death, Illness, Trauma, Rationing, Memories, Pain. Essentially what I gathered from all of this, was that my family members (extended) were deeply affected by WWII, specifically how it played out in London (Blitz). It seemed that most of them suffered from Post Traumatic Stress from dealing with war. This led me to research Freud's theories of trauma and object relation. I also started reading some essays on memory and how it is affected by traumatic events. I really believe that these painful memories are woven deeply into the fabric of my family and remnants of this could be detected even in my own childhood. I have started looking at images from the London Blitz and making drawings of them on the computer. I have begun to make paintings from these. 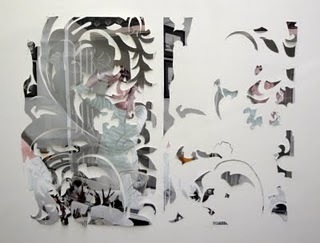 I am still trying to figure out how exactly I am to combine my pattern cut photographs into these new paintings. My In-Progress painting. This is 4'x5'. The days are zooming by! I cannot believe that it has been 5 weeks since I started. Apologies for not updating last week. It was kind of a blur, as this one will be too I expect. I have a presentation this week, a short essay due, starting a new job at Girls Inc, taking part in the orientation for the fine arts media lab (so I can print on Fine Art printers), and starting to construct a surrey bike from recycled bike parts (this is the 2nd idea---1st was too much work). The surrey is for a class I am taking with the visiting artist Abraham Cruzvillegas. He does a lot of found art sculpture and our class is taking part in an exhibition where we have to construct a vehicle. Everyone decided on teams (thank god). Anyway, I'm kinda excited to maybe get to keep this 2-3 seater bicycle/pedicab thingy. It could making going on little errands around the neighborhood kind of fun! At present, I have a had a couple of meetings with my advisors and they have all been very helpful. For now I am going to look more deeply into paper cutting and artists who practice within this medium. I bought a book this weekend called "Paper: Tear, Fold, Rip, Crease, Cut". 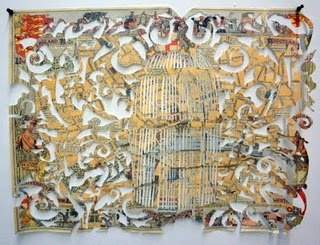 It has many amazing examples of artists working with paper. Some make drawings, some do installations, or furniture, or fashion. All I know, is that I have to practice a lot more. My laser cut piece, now painted white and resting against (for now) a black resin panel. Not quite finished yet. A piece that I am also working on. *Apologies for the sub par photography. Lighting in my studio is not the best for this. Have to bring in my own lamp I guess! 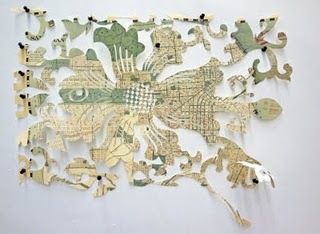 An illustrated map of London, cut out by hand with x-acto knife. Map of San Francisco hand cut. I don't think I have been this busy, ever. But, I have relaxed (a bit) and I'm beginning to really enjoy this! I turned in my first paper (only 1 page) on the topic of Peggy Phelan's "The Ontology of Performance: Representation without Reproduction", quite a heavy read. I still have a dull headache from the struggle to understand. Anyway, I have included some images of what I've been up to this last week. 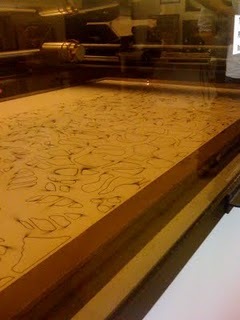 Lace and The Laser Cutter (Oh, how I love thee!) See the laser on the left, burning out the design. Tah Da! 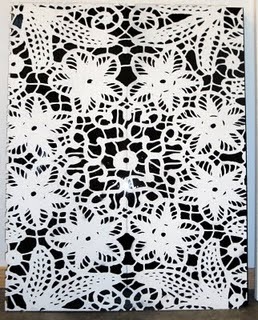 Presto, a 24" x 48" wood panel (1 of 2) laser cut from the vector drawing I did of the swatch of lace. It was really quite a pain in the --- to get the drawing ready, required learning some new skills (good thing) and begging the lab monitors that I could go over my 1 hour alloted time slot because it was my first time. I think I may have promised to bring baked goods next time. Anyway, I will be returning to complete the piece during my laser cutting session this coming Monday afternoon and will add the second panel to the left of this one. My plan is to paint it next, I think. I'm interested in layering two very different subjects. In further exploring my interest in photography of images from the home, to the mundane, I've decided to look a little more deeply into the clutter that surrounds our lives and the value we place on things/objects. The below picture is the lace pattern I have made with the wood above,but with a photograph of"clutter" overlayed on top.